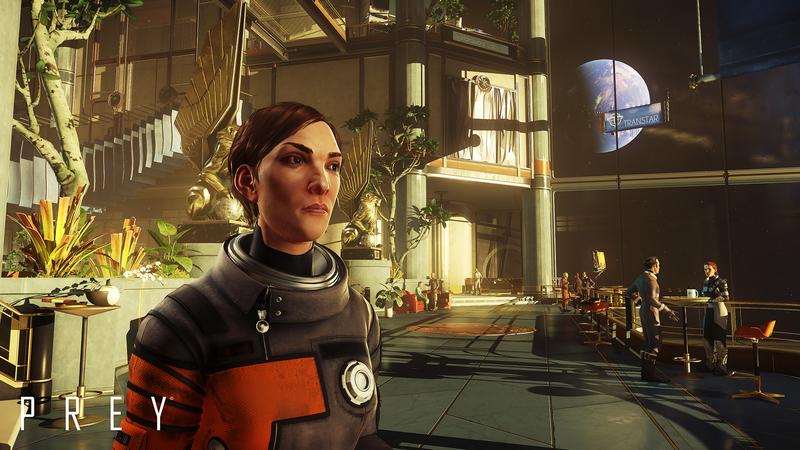 Prey gives us a glimpse at an alternate future where science thrives. In a new brief trailer, Arkane Studios reveals details about the world of their upcoming game Prey. The trailer revealed that the game takes place in an alternative timeline in which President Kennedy was never assassinated, allowing the space program to continue as planned. Because of this, an entirely different future emerges, one in which space exploration is well-funded and scientific studies thrive. All the while, American aesthetic sensibilities evolved along a different path. A fusion of styles from the real world 60s and 70s is present throughout the game. Such style can be seen in the structure of staircases and statues, to furniture and chandeliers. Prey is set in 2032, and the trailer gameplay primarily takes place on a space station called Talos I. Talos I is owned by Transtar, a mega high tech corporation. Transtar’s logo can be seen scattered throughout the space station in previously revealed gameplay. Those who have been eager to learn more about the world of Prey may have been wondering why Talos I looks so beautiful. After all, real world space stations are not known for their luxury, nor their hospitality. It seems Arkane Studios went with a more bright, colorful pallet in contrast with the way things are in our world. Transtar modeled Talos I off of the most opulent, classy hotels in America in an effort to attract investors. Talos I is not simply a hotel-like space station. It is also home to the most advanced technology of the age, and was made by Transtar to ultimately attract the best scientists in the world. Not much else has been revealed. But, having experience with these sorts of stories, it’s likely that something went scientifically awry, perhaps a Bioshock-esque breach of moral research standards that resulted in something monstrous. Regardless, we’ll be here waiting patiently for any new details to emerge. Prey is expected to release sometime in 2017 on Windows PC, Xbox One, and Playstation 4.